For the past four weekends, I’ve participated in a race. That means on either the Saturday or Sunday the past four weekends (and two more coming up) I got up early to go some location to run… at least 10k… is something wrong with me? Ha! Maybe! I knew when started registering for all these fall races I might regret it, but I don’t. 1. I had a migraine on Monday, and residual headache all week, so not feeling good. 2. I was feeling hormonal and grouchy. 3. I had been this intense hunger the previous couple of days so what if I was starving during the race? I wouldn’t be able to finish. 4. Were there going to be bathrooms on the route (even though I usually don’t need it). 7. I don’t want to have to deal with the weekend MTA line closures – which always means having to change your plans for travel because the subways are all messed up. I thought my list was pretty decent. Pick an excuse, any of them. Well, those who know me, know I am not a ditcher – unless there’s a really good reason. So as usual I wake up before my alarm on Saturday morning, I take my time in the bathroom, getting dressed, eating… I feel fine so I can’t really ditch the race. I guess I’ll go. Once I leave and get into the morning air, I feel good already. I stop for my usual small bottle of Poland Spring at the hole-in-the-wall place I always get it from and continue to the 6 train. Luckily, the station is open and downtown trains are running. The train goes one stop to Grand Central and I wonder if I should hop out wait for the express across the platform… but I know better. Stay on the 6. I ride down to Brooklyn Bridge/City Hall and get off the train, the last stop. I walk all the way west along Chambers Street towards the Hudson, knowing the start line is there somewhere. 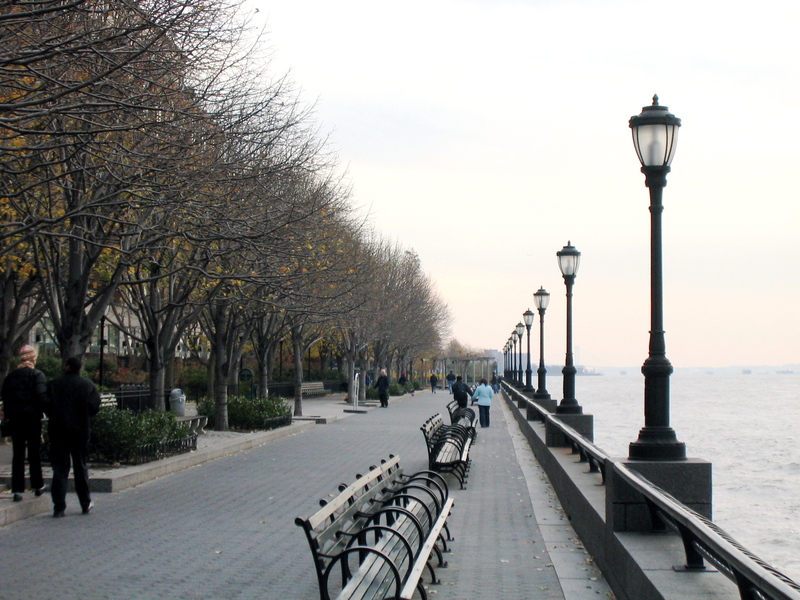 When I arrive at the River Terrace in Battery Park, I’m glad to see the beauty of the haze hanging on the Hudson. I love the sounds of the usual buzz of runners before a race. I know we are all there to not only run, but to support sustainable health initiatives in Kenya. We will make two laps on their mapped route. I already started making my list of reasons I was glad I didn’t ditch the race when I walked out my door and as we begin the run down along the river, I am mentally making a longer list of other reasons I’m glad I showed up. 1. A fisherman catching his first monkfish of the day. 2. The sound of the water against the wall. 3. The site of Lady Liberty in the morning haze. 4. Knowing I am running along the NY/NJ state line. 5. Watching an outdoor boot camp class as I run by. 6. Noticing that some leaves are yellow and have already fallen. 7. Discovering where Laughing Man Coffee Company is (click the link ladies 😉 ). 8. Watching the guard open the NJ Ferry terminal. 9. Watching the Staten Island ferry make one of its many daily crossings. 10. Listening to some lady yell at the volunteer for cheering us on because “everyone is sleeping” and I laugh out loud. My “reasons I’m glad I didn’t ditch the race” list beats my “excuse list” by far. So every time I think I don’t want to run, I need to remember why I do. But we will see how I feel next Saturday morning when I have to go down to Prospect Park… and the Q isn’t running! You amaze me with your lists. Your energy!! After babysitting for a week, I go to Yoga with a Cerebral Palsy Organization from my daughter’s home on Tuesday evening using DATS ( disabled adult transfer service). they pick you up from your base place and drop you off at your destination and re pick up and take you back to your home drop of center. This happens to be my daughter,s place and I am back before she starts her 12 hour night shift. I leave my apt Monday am at 0645 hr and go to her place (DATS) and stay there til Friday @ 1145 hrs and DATS brings me back to my apt. I walk my 5 year old granddaughter to her school bus stop for 0805 hrs and get my 1 year old grandson up etc. My granddaughter is in only 1/2 days Monday to Friday , therefore she is home by 1145 hrs. Until the end of Oct her mom goes straight from her night shift and works as a special teachers aid for extremely handy camped children until 1415 hrs.Their Dad works from 1500 to 0300 hrs Monday till Friday at 0300 hrs. On Saturday did not waked up until 1500 hrs and get up til 1730 hr, I was exhausted . Today I slept til about 1500 hrs. again. that is why you amaze me Tammy. My daughter amazes me, Mind you when I was younger and before I became sick I used to some pretty amazing things as well. Tammy always keep aware of your health, do the fun things now,,seems like you are.. never wait til later..that is one big mistake I regret.. Keep on going girl I am cheering for you!!! I know, my list was extremely lame. I’m thinking I would have to be in some serious pain before I ditched a run!